2019 is the year of the pig; it’s also the inspiration behind iSoftBet The Fortune Pig, an online slot celebrating the Chinese New Year. It’s also no coincidence that in Chinese culture, pigs are the symbol of wealth! Now add in 25 ways to win, fortune free spins, in-sync reels and cash respins, and it’s an iSoftbet casino game worth every bet. Chinese New Year slot machines make up some of the best casino games we’ve ever seen. This latest one from iSoftBet is no exception. What I like about Fortune Pig is the colourful game design, attention to detail, graphics and smooth animation. It’s also incredibly good at pulling off the traditional Chinese elements such as the music and celebration effects. The Fortune Pig online slot is 5-reel, 3-row and 25 ways to win casino game based on the Chinese New Year and the Year of the Pig. Highlights include spins from £0.25 to £25.00, a Fortune Free Spins Bonus and a game jackpot of 500 x coins. At 97.15% RTP, the slots payout rate is slightly below average but makes up for that with in-sync reels, iSoftBet’s smart way of improving the free spins bonus. Features include Cash Respins, Fortune Free Spins, In-Sync Reels and a Fortune Pig. What’s going on in Fortune Pig by iSoftBet? Ok, it’s the Chinese New Year, it’s the year of the pig, and it’s a new casino game for 2019. But what’s going on and how do you win playing Fortune Pig? Firstly, it’s a big celebration with dragons dancing and confetti falling from the sky. You must spin the reels (£0.25 to £25.00) and align symbols to win cash prizes, the usual online slot machine stuff. But then you’ve got features. Amidst the celebrations of the Chinese New Year, players must use their time wisely to rack up pay table prizes of 5 – 500 x coins across 25 pay lines, using the features to bring up those prizes when possible quickly. The big wins will come from the Cash Respins, and Free Spins bonuses within the game, the latter of which uses in-sync reels to spin reels in-sync. Also, it’s worth pointing out that a Fortune Pig can appear during a Cash Respin to collect money bags, more on this later. 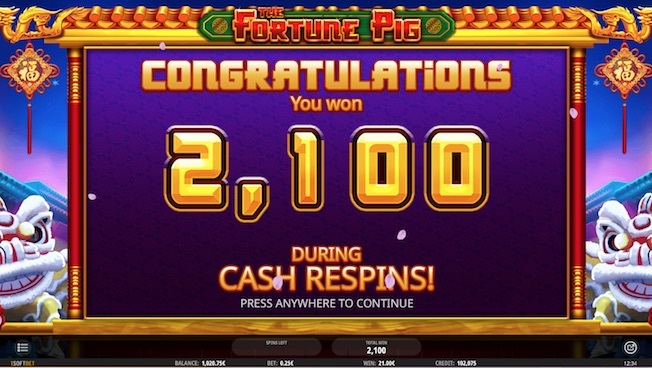 How much can you win playing the Fortune Pig slot game? In 2019, we’ll be looking at new casino games by their pay tables and telling players how much they can win. In Fortune Pig, if you play £0.25 a spin (£0.01 per coin), you could win £0.05 for 3 x J symbols, £3.00 for 5 x drums or £4.00 for 5 x golden dragons. At £0.25 a spin, the Fortune Pig jackpot is £5.00. To give you an idea of feature wins, 8 Fortune Free Spins paid out £6.25 whereas the Cash Respins win was £8.75. At the other end of the spectrum, high rollers and big betting players playing at £25.00 (£1.00 per coin) a spin could win £50 for 3 x Q symbols, £400 for 5 x golden dragons or a total game jackpot of £500. In the demo mode, I ran a £25.00 per spin game and triggered the free spins bonus, this particular time returned £160.00 (I did not trigger the in-sync reels which could have improved the prize total of the bonus). A single spin big win also returned £600 while Cash Respins paid out an impressive £1,475 (definitely the bonus to look out for). Wild – The standard wild we all know and love. 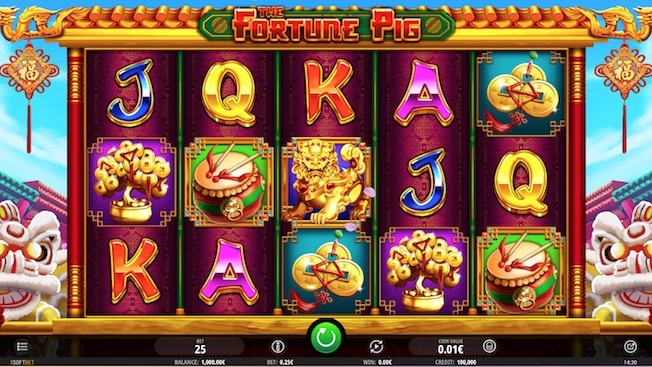 In Fortune Pig, the Wild is the golden pig and also the slots highest paying symbol. Cash Respins – The games best quality in terms of payout power. 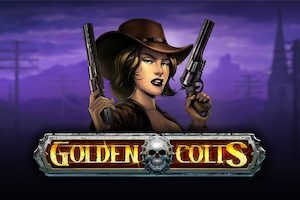 While hitting this feature a number of times in free play mode, it paid out more than the free spins most of the time, and by a considerable amount. Cash Respins is the slots main bonus and triggered by getting 5 or more money bag symbols on the reels. You’ll get 3 Cash Respins. The bonus with this feature is a Fortune Pig; these collect money bags leaving more room for additional money bags. Basically, it’s a game that adds up the money bags to pay a pretty decent prize. Fortune Free Spins – It wouldn’t be Chinese New Year without the lucky number 8, hence iSoftBet awarding 8 Fortune Free Spins when you land 3 golden dragons on reels 1, 3 and 5. It’s a not a bad number of free games, and that’s helped enormously by in-sync reels, this means that up to 5 reels can sync paving the way for some big wins by the end of the feature. Given the start of the Chinese New Year, the year of the pig and its symbol of wealth, nothing could be more fitting than iSoftBet’s new casino game. On graphics, Fortune Pig is one of the best Chinese New Year slots we’ve seen and a hallmark of standards to come in 2019. Key aspects to take away are 8 free spins with in-sync reels (could prove popular) while Cash Respins offer some of the biggest wins we’re likely to see in this type of quick bonus extra. 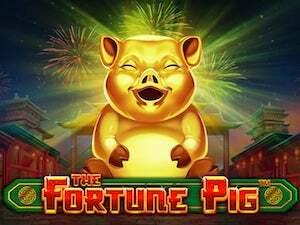 Fortune Pig is a celebration of iSoftBet and the developer’s ability to take on a theme with gratifying gameplay and rewards.